KARACHI: Saudi Arabia and UAE have planned huge investment in Pakistan in near future, Abdul Razak Dawood, Adivser to Prime Minister on Commerce and Textile said on Friday. “Saudi Arabia is planning to set up oil refinery in Gwadar,” he said, adding that the UAE was also planning to set up oil refinery. At a media briefing after meeting with members of Overseas Investors’ Chamber of Commerce and Industry (OICCI), he said that several other countries had also shown interest to invest in Pakistan. He said that Pakistan is presently ranked at 136 in the Ease of Doing Business. “Prime Minister Imran Khan has set a target to improve this ranking to 100,” he added. The adviser said that Pakistan needed investment. “The best investment is that which produce here and also export from here,” he said, adding that discussions were underway with China on this matter. 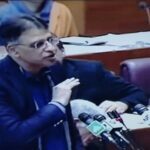 He said that PTI government had inherited economy in very bad shape. “However, it is improving. Exports are increasing and imports are declining,” he said and added that during next six months a visible decline would be seen in trade deficit. Dawood said that the discount rate had been increased for monetary tightening.